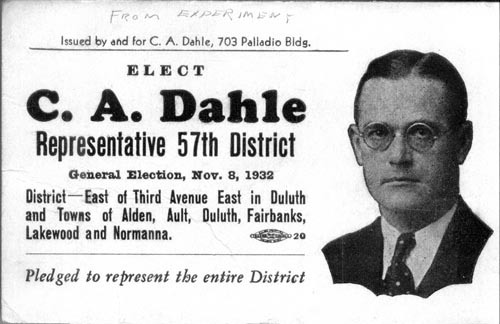 Elect C. A. Dahle, Representative 57 District, General Election, Nov. 8, 1932. District - East of Third Avenue East in Duluth and Towns of Alden, Ault, Duluth, Fairbanks, Lakewood and Normanna. Issued by and for C. A. Dahle, 703 Palladio Bldg. Are you looking for DAHLE ancestors? If so, we suggest posting a query to our Community Message Board to get assistance from other researchers.